The Petcube Camera was the first tech gadget that allowed pet owners to watch, talk to and play with their dogs or cats from their smartphones. 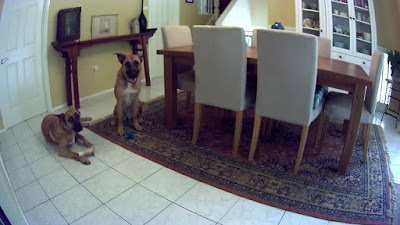 I first discovered the Petcube Camera when we compiled our "10 Best Tech Gadgets for Dogs" last year and I could not wait to finally trial it. But the Petcube, as I would discover, is more than just a camera to spy on your pets – it is interactive – allowing you to not only hear and watch your dogs, but talk and play with them too. 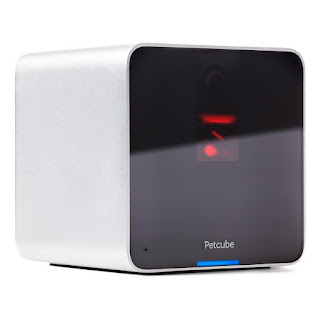 Like its name implies, the Petcube is a generally cube-shaped device measuring just under 10cm on each side. While its front and back panels are completely flat with sharp right angles defining them, the side corners are rounded. The modern design is striking with solid aluminum sides, whilst the front is protected by a transparent black glass plate that conceals the camera and laser pointer. The back panel holds the micro USB port that connects to the included wall adaptor to power it, along with a Power button. A silicone square on the bottom holds the camera in place, and a standard tripod screw-mount in the middle lets you secure the Petcube further. The camera has a 2-way audio, allowing you not only to hear your pets but you can also talk to them to their utter confusion the first time this happens! The camera also comes with a laser light which you can turn on and off and you simply use your finger on your phone to move the beam around the room (this feature is probably more appealing to cats than our dogs). 1. Download the free Petcube app from your phone’s app store, and it easily walks you through the procedure. 2. It will direct you to connect to the temporary Wi-Fi hotspot the unit sets up so you can enter your own Wi-Fi network information (briefly leave the app and go into your phone's settings). Once it's configured, the camera will connect to your Wi-Fi network automatically. 3. After that, all you need to do is register a free account with Petcube and register the camera with the service and you can access it from anywhere. As soon as I signed up, I got an email welcoming me to the Petcube community. And then about 5-10 minutes after I set up the camera to be connected to my app, I got an email asking me how it was going. They really seem to care that you are having a good experience with their product. You will receive tips & tricks once or twice a week (if you choose to) to improve your overall experience of the Petcube app. 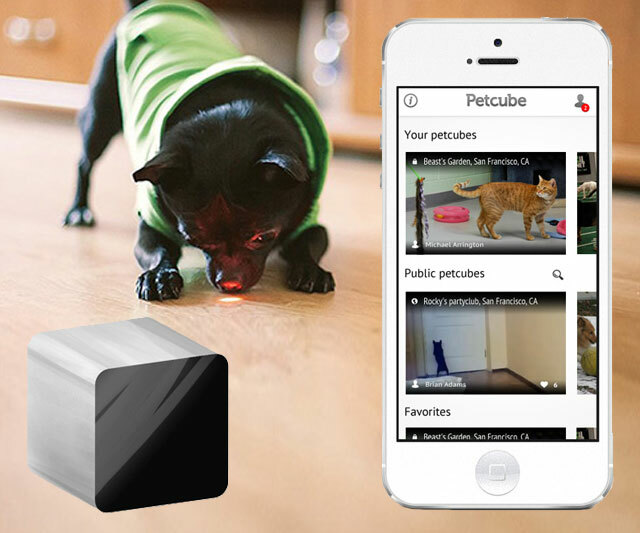 The Petcube App is a free app for iOS and Android users. 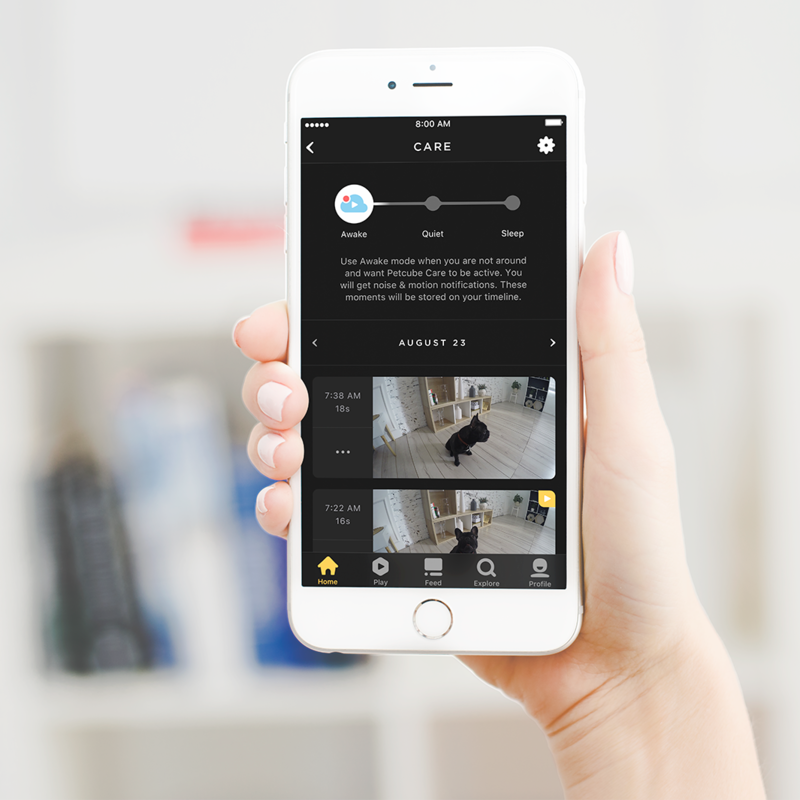 Via the Petcube App, users can share access to their Petcube Cameras from anywhere, share photos of their pets and find new friends. You can click on the icon that looks like the Petcube camera to access your camera at home. You can also adjust the settings of the camera to deliver push notifications when your dogs have entered the room via the motion detector on the camera. Lastly, you can have a profile on the Petcube app and treat it similarly to your own Instagram account within the Petcube app. 2. Access (and potentially control) other Petcube cameras if users have made them public and shortlist your favourites. You'll even get an alert when their camera goes live! Aramis & Porthos wondering what magic is afoot this time! 3. Capture photos and videos of your pets. 4. Meet other pet owners through the App and share your photos, videos, etc. Discover other pets using the Explore feature. 5. Play with your pet using the laser toy. Petcube cameras are already in thousands of shelters so you can brighten up the day these cats and dogs. 6. Customise access for family, friends or a pet sitter. They first need to download the app and set up their account then as the administrator, you can press the sharing button on the home page and search for their user name to grant access to your Petcube's feed. You automatically receive a 30-day free trial of the Petcube Care feature, starting from the day you set up your account. This cloud video recording service uses sound and motion detection to catch clips of your pet throughout the day. You can then review and rewind through a timeline of clips. At the end of your trial, you will have the option to subscribe monthly to get access to 10 or 30 days of video history. I was actually surprised by how much of the room you can see (no blind spots) and you can get a close-up view of your pet by pinching to zoom in on the action. Both the speaker and microphone work perfectly well, and in my tests, I could talk to our dogs (much to their confusion) through the app on my smartphone. The only downside I could find it was that there is no night vision in this original model – so if your house is dark, you can’t see your pets. This may be disappointing for cat owners but as far as our dogs are concerned, they won't be wandering during the night so we would only be missing out on some "snoring action"! However if this feature matters to you, their latest model, the Petcube Play, offers both night vision and a 1080p HD camera. Disclaimer: Product gifted by Petcube for editorial consideration. 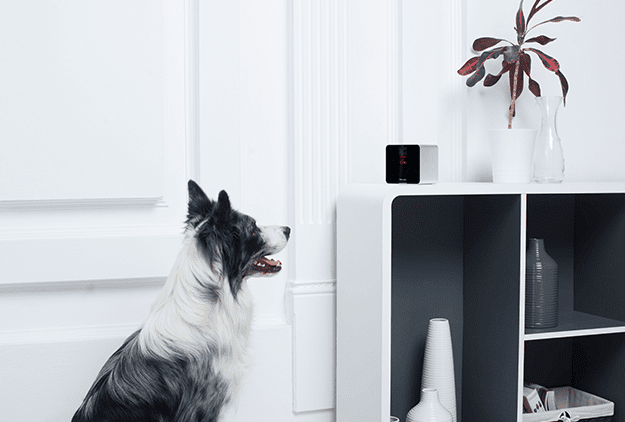 Petcube keeps people connected with their pets. 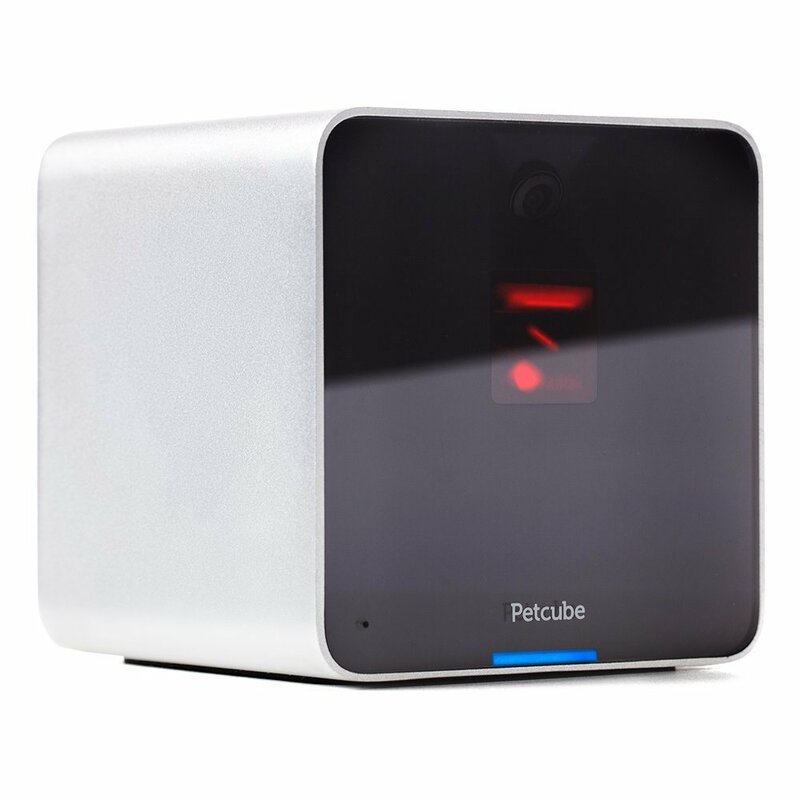 Its first product, Petcube Camera, is an interactive pet monitor with real time video and built-in laser pointer. It allows pet owners to watch, talk to, and play with their pet from their smartphone, no matter where they are. Petcube was funded on Kickstarter and became one of the most successful crowdfunding pet products in history.